In honor of Good Friday and on a lighter note; someone I know caught a large striped bass and made it into a movie with a gospel presentation. Thought you might enjoy watching it, and if you know of any sportsmen out there, you could send them the link—it would be a great way to get the gospel to them. Several data points are indicating that Passover 2019 has the potential for the occurrence of a major event(s). Passover this year begins on the evening of April 19th, 2019 and on April 20th in the Diaspora. Here is the data pointing to, and related to that time. Nibiru Large Earthquake Watch: A large earthquake watch runs from 4/11/19 to 4/25/19 and is centered on 4/18/19. In case you were not aware large earthquakes have been occurring in a 47 day pattern theorized to be caused by the 47 day orbital period of Nibiru. The Dollar Code: Putting the Nibiru 47 day orbital number into the dollar code date calculation formula yields the following. 19.47 x 12.47 = 242.7909 = 242 years and 289 days. July 4, 1776 + 242 years and 289 days = April 19, 2019. Let me remind you that many past dollar code dates which had important events occur on them and were found before the event occurred, were discovered using the dollar code date formula. And some of those events were Temple related. See The Dollar Code. Passover occurs 10 days after the Israeli elections and 9 days after our April 10 watch day. We also have a prominent Jewish Rabbi saying that the Messiah will arrive before April 9, 2019. Of course we know that the next Messiah to show up in Israel will be the false one—the antichrist. Another important item to keep a look out for is that President Trump and team have stated that their “Deal of the Century” peace plan will be revealed shortly after the Israeli election. This peace plan is reported to include dividing the land of Israel, which in the past has brought swift judgment upon the USA. April 20th 2019 is 500 days after Trump declared Jerusalem Israel’s capital. April 20th 2019 is 1300 days after the last blood moon of 2015. That is the data, if you have anything to add please leave a comment. Whether or not anything of significance will occur on Passover 2019; like the possibility of an official Passover ceremony being conducted, or a peace plan announcement, or a large earthquake, or something else of significance, is yet to be seen—that is why we watch. Some prophecy types are saying that the rapture will occur sometime around Passover in 2019. I firmly disagree, the rapture is not imminent, because the antichrist has not come on the scene yet and the abomination of desolation has not occurred yet. God tells us that these must happen first. Some agree that the antichrist and the AoD must happen first but think that the AoD and the antichrist taking over the world occur at the beginning of the last 7 years. However God in scripture again tells us that this is not correct. Those verses indicate that the Abomination of desolation happens 1290 days before the end, which puts it right around the midpoint of the last 7 years—not at the beginning. Therefore it is impossible for the rapture to occur now because the prerequisite events have not occurred yet. In fact the latest prophetic data is suggesting that the rapture will not occur until sometime after March of 2023. See the post; Calculations for the "End of Days". But in the meantime; all eyes on Passover 2019—it is ripe for a major event(s). I forgot to mention that is is also the time for the occult fire sacrifice--April 19 begins the Ritual of Fire. Are you 100% sure that you will go to heaven? The end times are knocking on the door and so is Jesus. He wants to save you, will you let him in? Find out what you must do to be saved, click here. Do you know what will happen in the end times and how to prepare for them? I wrote a book to help you. It is entitled The Coming Epiphany and will explain to you, in an easy to understand format what you need to know about the end times. The Coming Epiphany is available in paperback and as an eBook on Amazon.com and is also available for FREE here. Want to learn about Cryptocurrencies and their possible role in the end times? Read; Cryptocurrency and the End of the World. About the author: William Frederick; M.Div. has been preaching and teaching the Word of God for over 30 years. He has dedicated his life to serving God and helping others come to a saving knowledge of the Lord Jesus Christ and understand essential end times Bible Prophecy truths. He is the author of several books including The Coming Epiphany and The Dollar Code. His articles are originally published on The End Times Forecaster Blog. From there, his articles are published and referenced on various prophecy news related websites. If you would like to republish his articles, please feel free to do so, just please include the original link to the article. The more people that see this information the better, and we need to wake more people up while there is still time. Large earthquakes have been occurring in a 47 day pattern. It has been theorized that this 47 day pattern of earthquakes, which matches the reported 47 day orbital period of Nibiru, is being caused by Nibiru. See the post: Beware of the Nibiru 47 Day Large Earthquake Cycle. The next watch period in the 47 day pattern centers on 4/18/19 and runs from 4/11/19 to 4/25/19. According to the data, on average we should see at least 6 ea M6.0+ with about an 88% chance of a M7.0+. Though let me mention that this 47 day watch cycle has been the least active in recent years. The more active 47 day cycles are the next two that are coming up. The next 2 watch periods encompass the 2 week period centered on June 4, 2019, which runs from 5/28/19 to 6/11/19, and the 2 week period centered on July 21, 2019, which runs from 7/14/19 to 7/28/19. Let me also mention that if it is incoming energy from Nibiru that is causing these earthquakes, that there also exists the possibility of an increase in volcanoes and large storms. Here are some hotspots that are prime and are being watched for earthquake and volcanic activity. Indian Ocean expects MEGA TSUNAMI. In the coming days, perhaps - hours. World War III is approaching - Hawaii can no longer wait. In Indonesia, an earthquake occurred right in the caldera of the super-volcano Toba. Lake Yellowstone: On March 21, magma reached the bottom. As Nibiru gets closer the earthquakes, storms, and volcanic activity will increase. Eventually when Nibiru gets here, IMHO this is what will happen. This of course is also the time that the rapture occurs; that is why men hide in the caves and dens, because they see the Lord Jesus appear in the sky—at the rapture. And after the rapture, as the scripture above tells us, the wrath of God is poured out upon the world—“and who shall be able to stand?” If you would like to be included in the rapture so that you can escape the wrath of God, you must be saved. Jesus died for you wants to save you. Find out what you must do to be saved, click here. Do you know what will happen in the end times and how to prepare for them? I wrote a book to help you understand and prepare for the end times. It is entitled The Coming Epiphany and will explain to you, in an easy to understand format what you need to know about the end times. The Coming Epiphany is available in paperback and as an eBook on Amazon.com and is also available for FREE here. Do you want to learn about Cryptocurrencies and their possible role in the end times? Read; Cryptocurrency and the End of the World. Tensions are building in Israel; from the Netanyahu bribery charges, the Israeli election, the Gaza and Golan situation, and the skirmish in Syria—tensions in and around Israel are building. And on top of all of that, there is data suggesting that a “big event” is possible in Israel in April 2019. Let’s first examine the data and then I will comment. The data was left in the comment section of a recent post by Brent 188. These are the signs in the heavens that I have been watching and correlating to real time events with biblical numbers of last day’s significance. These are the signs in our days pointing to the temple mount and what is coming to fulfill biblical prophecy right before our eyes. These are and have been signs in the heavens pointing to earthly events that have been accurate to the day and I believe will continue to be. There is absolutely no question that these signs in the heavens are showing signs in the earth with biblical prophecy timelines that are being fulfilled to the day of great significance to all mankind. I would say that something historic, life changing, earth shifting and even heaven shaking is going to happen in our very near future. The numbers 490 1150 1260 1290 1335 and 2520 day time frames are all pointing to the temple mount and have been connected to the blood moons the galactic alignment and events on earth politically and with feasts of the Lord of religious significance that have happened in there time frames and sequences right before our eyes. So with that let’s consider a few things. Considering: that the last blood moon of 1968 on sukkot going back 490 days was June 5th 1967 the start of the six day war that gave Israel Jerusalem after almost 2000 years was a sign in the heavens and a Harbinger. Considering: that the Galactic alignment of Dec 25th 2012 (a sign is always given before the actual event which was the 21st to most.) and pointed to the blood moons of 2014 and 2015 with April 29th 2014 falling 14 days into the blood moons and being 490 days after Dec25th 2012 the last day of a 9 month peace negotiation between the U.S. Israel and the Palestinians that was not ratified but was a big sign in the heavens and a Harbinger. Considering: that each of the four blood moons was on a feast day of the Lord. The first on Passover the second on sukkot the third on Passover again and the fourth on sukkot again. Considering: that April 10th 2014 was five days before the blood moons and was 1335 days before Trump declared Jerusalem Israel’s capital on December 5th/6th 2017 which was a sign and a Harbinger. Considering: that April 10th 2014 again was five days before the blood moons and was 1260 days before the revelation 12 sign of the woman in the heavens September 21st/22nd 2017 was a sign and a Harbinger. Considering: that 490 days before the first blood moon was Hanukkah pointing to the temple mount. Considering: that 490 days before the third blood moon was Hanukkah again pointing to the temple mount. Considering: that 490 days before the fourth and last blood moon was a holiday celebrating Mohammed’s ascension again On May 26th 2014 pointing to the temple mount. Considering: that December 6th 2017 the day that Trump recognized Jerusalem as Israel’s capital was 1290 days after May 26th 2014 which was 490 days before the last blood moon. Considering: that 490 days after the last blood moon on January 30th 2017 and was the exact day that the 2nd temple was completed on January 30th in 516 B.C. Considering: that 490 days after the last blood moon on January 30th 2017 again was the day that the new Sanhedrin officially presented the new temple tax coin the half shekel. I consider those two events on the same day of January 30th millennia apart as two witnesses to the 490 day patterns of the signs of before the blood moons. Considering : that March 20th 2015 was the total solar eclipse in the middle of the blood moons and that 1150 days later was May 13/14 2018 the anniversary of Israel’s independence day and the day that the United States opened its US embassy in Israel. Israel uses another calendar that is a floating calendar and their independence day changes dates from year to year. Considering: that on June 30th 2015 in the middle of the four blood moons was another sign in the heavens that I have just recently become aware of. It was an alignment of Venus and Jupitar in such close conjunction that they looked like one star in the sky and it was called the Bethlehem star or the messiah star and it was in the constellation of Leo / the lion of the tribe of Judah. 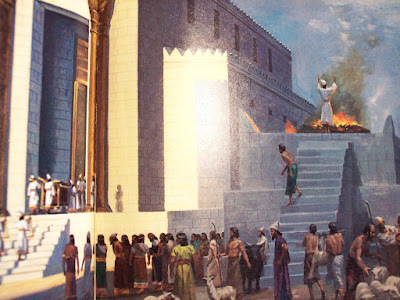 From that day June 30th 2015 to December 10th 2018 was 1260 days and the last day of Hanukkah and the day that the new alter was dedicated for the new temple with 70 nations invited to the celebration. Considering: that January 19th 2019 is 40 days after the dedication of the new alter for the new temple. Considering: that January 20th 2019 is a blood moon and falls on the second anniversary of trumps inauguration. Considering: that January 26th 2019 is 490 days after the revelation 12 sign of the woman in the heavens. And considering what the Lord just showed me in a word of knowledge on December 14th 2018 and confirmed it the next day December 15th 2018 the day Australia accepted Jerusalem as Israel’s capital. Let me say it again, I am not date setting and this will not be the rapture or even more obviously the abomination that causes desolation. But it would seem to be a very large move on the chess board of the world that will have the rest of the pieces scrambling to position themselves for safety and will probably set in motion biblical prophecy swiftly. We will see. The Lord showed me on Dec 14th 2018 that April 10th 2019 is 490 days after trump declared Jerusalem Israel’s capital. He showed me that April 10th 2019 is 1290 days after the last blood moon of 2015. He showed me that December 25th 2018 was 490 days after the Great solar eclipse over America. Early elections that did not come in the time of the set times for elections. April 10th 2019 is 490 days after Trump declared Jerusalem Israel’s capital. April 10th 2019 is 1290 days after the last blood moon of 2015. December 25th 2018 when the decision was made was 490 days after the Great solar eclipse over America. Israel hard - line minister to form “New Party" ahead of vote. That in itself is a confirmation on the word of knowledge and would seem to fulfill it but I think that there is more to it and we will have to at this time wait to see what the elections bring about and the effects of this new party and what implications all of this has on the peace deal, Jerusalem and the temple mount. Considering that April 10th 2014 was five days before the blood moons and was 1335 days before Trump declared Jerusalem Israel’s capital on December 5TH/6TH 2017 which was a sign and a Harbinger. Considering that April 10th 2014 again was five days before the blood moons and was 1260 days before the revelation 12 sign of the woman in the heavens on September 21/22 2017 and was a sign and a Harbinger. Considering that April 10th 2019 is 490 days after Trump declared Jerusalem Israel’s capital on December 5th/6th 2017 and was a sign and a Harbinger. Considering that April 10th 2019 is 1290 days after the last blood moon of 2015 on September 27th/28th 2015 and was a sign and a Harbinger. And considering that the Numbers of 490, 1260, 1290 and 1335 are all seen in these signs and Harbingers. That is the data; and as you can see it appears that April 10th, 2019 is prime for a major event, and further the data is indicating that the event may be connected to the Temple. One week after the Israeli elections next month, a reenactment of the Passover Temple service will be held. Hidden in the elections is a Temple Mount agenda that may determine whether the ceremony will be a reenactment or an actual service that will return the most important element of the Jewish Temple. It is important to note that the Israel elections will take place on April 9, just six days before the reenactment and ten days before the eve of Passover when, if the government would permit, the actual Passover sacrifice would be performed. Could April 10th be the day when it is announced that there will be an actual Passover service? Even if not the day is still prime for something else of significance to occur. 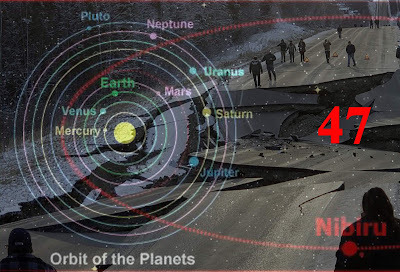 BTW; the 47 day Nibiru large earthquake watch runs from 4/11/19 to 4/25/19. Are you 100% sure that you will go to heaven when you die? The end times are knocking on the door and so is Jesus. He wants to save you, will you let him in? Find out what you must do to be saved, click here. Bo Got It Right Again! Bo Polny of Gold 2020 forecast issued 2 videos a few days ago in which he forecasted that his cycle analyst was indicating an imminent spike in Litecoin and Bitcoin. Both Bitcoin and Litecoin spiked today. The Crypto wave is coming, if you don’t believe me check out what a Central Bank insider said; Look What a Central Banking Insider Just Said About Cryptocurrencies. If you would like to read a good overview of the whole Cryptocurrency concept and possibly get involved, see the post; Cryptocurrency and the End of the World. The end times are knocking on the door and so is Jesus. He wants to save you, will you let him in? Find out what you must do to be saved, click here. Do you know what will happen in the end times and how to prepare for it? The Coming Epiphany will explain to you, in an easy to understand format what you need to know about the end times. The Coming Epiphany is available in paperback and as an eBook on Amazon.com and is also available for FREE here. The information provided in this blog and any posts is without warranty of any kind and, in particular, no representation or warranty, expressed or implied, is made nor to be inferred as to the accuracy, timeliness, or completeness, of any such information. Under no circumstances shall William Frederick or any ministries he is associated with will have any liability to any person or entity for a loss or damage in whole or in part caused by, resulting from, or relating to any error (neglect or otherwise) or other circumstances involved in procuring, collecting, compiling, interpreting, analyzing, editing, transcribing, transmitting, communicating, or delivering such information, or any direct, indirect, special, consequential, or incidental damages whatsoever, even if William Frederick is advised in advance of the possibility of such damages, resulting from the use of or inability to use, such information. Also this blog and posts are for displaying my opinion only and does not necessarily reflect the views of any ministries I am involved in. Any news or links are the subject matter of those sources and not necessarily the opinion of the author. The financial information is OPINION unless otherwise stated. All information presented on this blog and or posts are not investing advice nor recommendations for investing decisions. If you wish to use this information for your own personal investing decisions, you do so at your own risk. The author of this blog advises you seek a professional financial adviser for all matters regarding personal investments. The author shall not be held responsible for the actions of others nor decisions made based on the information presented within these pages. All statements herein are made without prejudice and malice. Calculations for the "End of Days"
Books by William Frederick M. Div. Chapter 5: Why Does It Matter? This Chart Says It All! Look Out Below! M7.0 Alaska Earthquake: The 188 Day Earthquake Cycle Hits Again! More May Be Coming! Are They Signaling Lights Out? The information provided in this blog is without warranty of any kind and, in particular, no representation or warranty, expressed or implied, is made nor to be inferred as to the accuracy, timeliness, or completeness, of any such information. Under no circumstances shall William Frederick or any ministries he is associated with will have any liability to any person or entity for a loss or damage in whole or in part caused by, resulting from, or relating to any error (neglect or otherwise) or other circumstances involved in procuring, collecting, compiling, interpreting, analyzing, editing, transcribing, transmitting, communicating, or delivering such information, or any direct, indirect, special, consequential, or incidental damages whatsoever, even if William Frederick is advised in advance of the possibility of such damages, resulting from the use of or inability to use, such information. Also this blog is for displaying my opinion only and does not necessarily reflect the views of any ministries I am involved in. Any news or links are the subject matter of those sources and not necessarily the opinion of the author. The financial information is OPINION unless otherwise stated. All information presented on this blog is not investing advice nor recommendations for investing decisions. If you wish to use this information for your own personal investing decisions, you do so at your own risk. The author of this blog advises you seek a professional financial adviser for all matters regarding personal investments. The author shall not be held responsible for the actions of others nor decisions made based on the information presented within these pages. Copyright: Information in this site may be used with hyperlink to the page the information appears on. Comments: All are welcome to comment in the pursuit of a meaningful exchange of ideas. Inappropiate or vulgar comments will be deleted. Copyright disclaimer; Under section 107 of the copyright act of 1976 allowance is made for “fair use” for purposes such as criticism, commenting, news reporting, teaching, scholarship research, etc. This site may contain copyrighted material the use of which has not always been specifically authorized by the copyright owner. It is used solely for the purpose of private study and research which constitutes 'fair use' of any such copyrighted material as provided for in section 107 of the US Copyright Law.Fair use is permitted by copyright stature that might otherwise be infringing. Non profit, educational, or personal use tips the balance in favor of “fair use.” The material on this site is distributed without profit to those who have interest in receiving the included information for their own research and study.